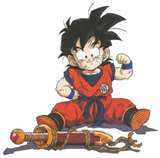 Goku is the main character of the DragonBall series. He has transformed into all the Super Saiyan forms (Super Saiyan 1-4) As a baby,he got hit in the head, which made his Saiyan characteristics disappear. Vegeta is Goku's Rival. He has transformed into 3 out of the four Saiyan transformations.In the beginning of the series,Vegeta had a battle and lost. Krillin almost killed him but luckily for Vegeta,Goku told Krillin to let him go. Gohan is Goku's son. Gohan has a lot of potential and strength. Once, in the Frieza Saga, Gohan got mad and used a powerful attack on frieza. Gohan has the abillity to transform into Super Saiyan and Super Saiyan 2. When Gohan transformed SSJ2 (Super Saiyan 2 ) it was because Android 16 got killed by Cell.